Dusty debris found around planetary embryos in a 500 light year distant system by astronomers using the Gemini South telescope bears no resemblance to the planetary building blocks of our own Solar System. 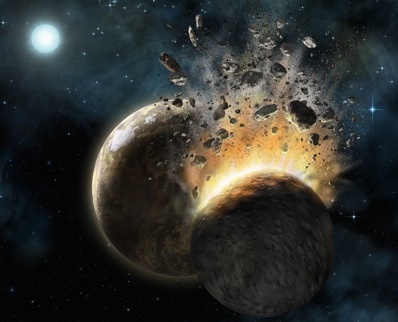 Artist’s impression of what HD 131488’s inner planetary system might look like as two large rocky bodies collide. Image: Lynette Cook for Gemini Observatory/AURA. The quantity of warm dust is unusually large, say the astronomers, who propose that the most likely explanation is a recent collision of two rocky bodies. This would also provide a source for the dust particles. The distal cold dust, on the other hand, is most probably left over from planet formation that took place further away from the sun. The location of HD 131488�s dust belts (top) and comparable regions to our own Solar System (bottom). 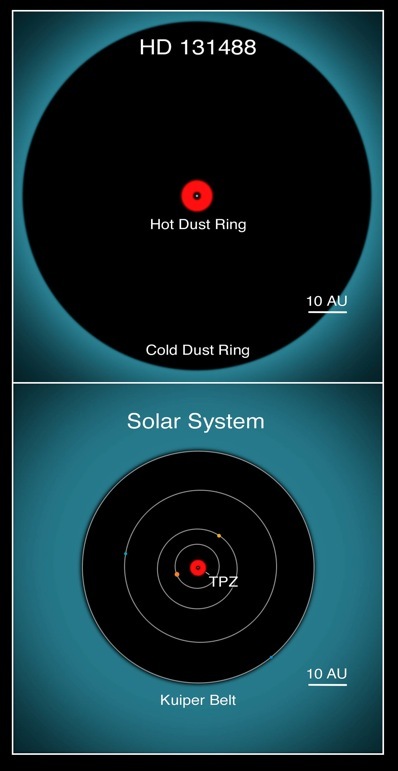 TPZ = terrestrial planet zone. Image: Lynette Cook for Gemini Observatory/AURA. The star joins five other systems bearing suns a few times more massive than our Sun that also show evidence of dust in their terrestrial planet zone. But this is five out of thousands of intermediate mass stars – why are these warm dust rings apparently rare? The astronomers note that all five of these stars have ages in the range of 10-30 million years, suggesting that catastrophic collisions – like the one that resulted in the formation of the Moon in our own Solar System – occurred in this narrow age range for stars of this mass. Further study of HD 131488 and of other similar systems is planned by the team. The infrared imaging and spectroscopic observations in this study were conducted using the T-ReCS instrument on the Gemini South telescope located in Chile. Other observations were made using the Infrared Astronomical Satellite (IRAS) space-based infrared observatory, the NASA Infrared Telescope Facility (IRTF), and the Keck II telescope and optical observations from the Keck I telescope, the Siding Spring Observatory (SSO) 2.3-metre telescope, and the Tycho space-based imager/astrometer that flew aboard the ESA Hipparcos mission.